Pair of craft wings for making a fairy doll. Sheer nylon stretched across metal frame. Each wing measures 2-1/2 inches in length. Pair of craft wings for making a fairy doll. Sheer nylon stretched across metal frame. Each wing measures 2-1/4 inches in length. Pair of craft wings for making a fairy doll. Sheer nylon stretched across metal frame. Each wing measures 2 inches in length. 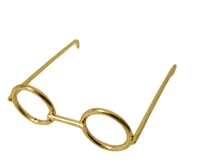 2" gold metal wire rim eye glasses. Accessory for making craft dolls, bears, Santa Claus, etc. Pair of craft wings for making angels. 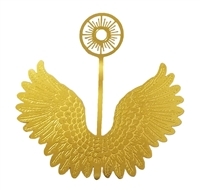 Made of soft, bendable metal in gold tone. Measure 60 mm (2-3/8 inch) by 38 mm (1-1/2 inch). Pair of craft wings for making angels. 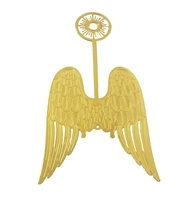 Made of soft, bendable metal in gold tone. Measure 80 mm (3-1/8 inch) by 80 mm (13-1/8 inch). Pair of craft wings for making angels. Made of soft, bendable metal in gold tone. Measure approximately 105 mm (4 inches) long by 55 mm (2-1/8 inches) wide. 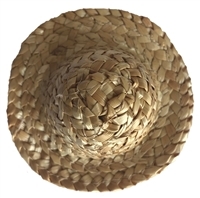 Natural Straw Wicker Sun Hat for Dolls, Barbie, Bears, Craft Doll Hat Making. Measures 3-1/4 inches in diameter and approximately 1-3/4 inches tall. 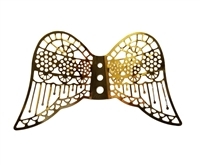 Pair of craft wings for making a fairy or angel doll. Sheer nylon stretched across gold wire metal frame. Measure 4-3/4 inches wide.